Dude, where’s my fuel cell car? It’s 1994 and a new breakthrough in fuel cells has taken the world by storm. “We could be manufacturing and selling clean hydrogen-powered cars any day now! How soon? Let’s say … 2000.” A newspaper article just like that is how I got into fuel cell engineering almost 20 years ago. Well, it’s now 20 years later, and Toyota has just announced the sale of its fuel cell Mirai car. It can actually be purchased by consumers – not just leased. Quantities are in the hundreds, and it’s obviously restricted to the areas where hydrogen refueling is available, but it’s a huge milestone. After these decades of hard work in the chemistry labs and engineering workshops, machine shops and test tracks, , it’s interesting to look back on the hype and overblown ambitions that led here. 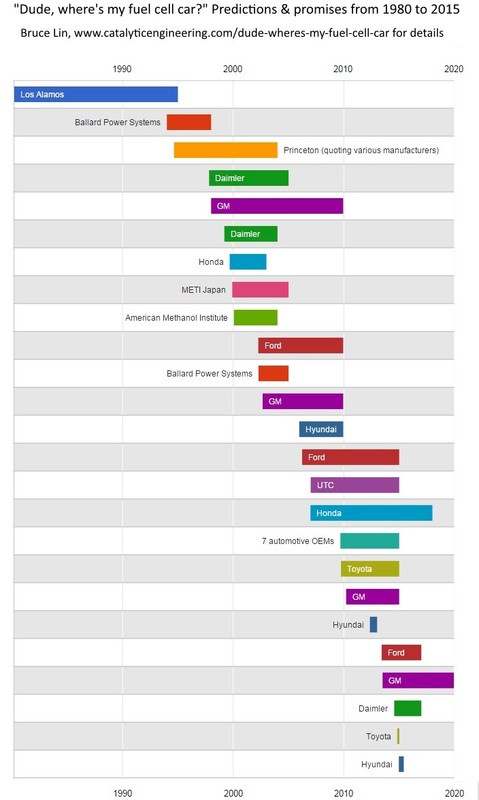 The interactive timeline below shows how long various people thought it would be before fuel cell cars became commercial. Hover over each bar for a full quotation, or click for a link to the original article where available. Do you remember other irrationally exuberant fuel cell claims? Or uncannily accurate predictions? Leave a comment with a link to the original article and we’ll update the chart. It’s 2001 and while car companies are pouring hundreds of millions of dollars into fuel cell research, it hasn’t happened yet. The hydrogen distribution network is slow to materialize as well. “Let’s carry forward alternative options like liquid fuels, like methanol and gasoline, that are reformed onboard into hydrogen. Better update commercialization to 2005. I’d say that’s ‘aggressive but do-able’ “. 2004 has rolled around and onboard reforming is looking too complex to meet driving expectations. “We’ll switch to onboard compressed hydrogen cylinders, and leave it to someone else to figure out production and distribution. Better add a few years and make commercialization 2008. We could lease a fleet of a few dozen cars to carefully selected drivers by then – that counts as commercialization, right”? For International Fuel Cells, a former division of UTC, you use a quote from the notes of Joan Ogden of Princeton (not a UTC or IFC spokesperson). Here’s an official published article featuring UTC in 2007 that got it pretty right (2015) and BTW, our fuel cell bus power plant fielded in 2008 has exceeded 18,000 hours of operation without cell or stack replacement. Unfortunately, UTC stepped away from fuel cells a couple of years ago, but our licensed fuel cell technology lives on in several vehicles coming to market now. 2007: “For some OEMs, we provide a complete fuel cell system and help integrate it into a vehicle – that example might best describe our relationship with Hyundai. On the other hand, we also do basic R&D work with OEMs. We even help on manufacturing development with a number of car makers…I think 2015 is a reasonable time for this technology to begin to come to market,” adds Gorman. Good point Mike. I believe it was an accurate quotation but I will make the indirect attribution clearer. Those UTC porous plates definitely had some big advantages. I remember looking at published polarization curves running straight out to several A/cm^2. I’d like to add the 2007 data point as well. Do you have a copy of that issue of the E&HVT? Yes. I sent you a copy. Thanks for making the adjustments on the chart.